Is your food budget going through the roof? Tired of binge buying and then having to trash what spoils? Perhaps all you need to do is plan ahead. Make a monthly menu plan, shop once a month, and make meals in advance to freeze. So you think it’s not very appetizing to eat a frozen, pre-made meal? I’m sure you’ve purchased frozen, pre-made meals in the past, a quick fix for supper, tasty but full of additives and preservatives. Wouldn’t it be better to make your own from scratch, using the best and freshest products available? It’s not quite as onerous a task as you would think. All you need is a little planning, good organization, and an insightful book to lead you through the mires and pitfalls of preparing meals a month in advance. 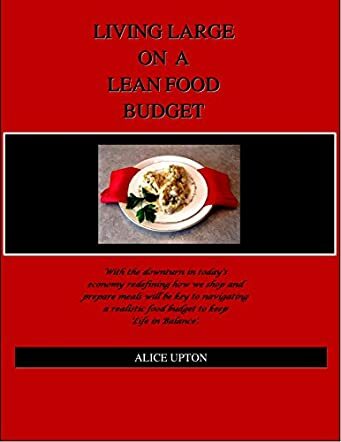 Alice Upton has given us just that tool in her new book, Living Large on a Lean Food Budget. She’s worked in food preparation for years and comes very qualified to know how to plan well and plan safely. And, yes, safety in food preparation is a serious issue. Like trying to cool foods on the counter before freezing can allow bacteria to take up residence, but it is imperative to make sure the food is thoroughly cooled before freezing to ensure top quality when serving later in the month (and, yes, this can be done safely without leaving the hot food on the counter for hours). From planning the menus, to making the shopping list, to organizing the shopping list, to following the grocery store’s floor plan (that’s assuming the grocery store hasn’t changed its floor plan which ours does quite frequently, much to my annoyance), to preparing the meals, to properly packaging the finished meals - this book has everything you need to be creative, industrious, economical and a great gourmet chef ... all on a lean budget. And then, there’s the recipes: lots of them. This is a great resource with great recipes. A real treasure.